I am a research hound ( my Goldens do not find my play on words at all entertaining ) and have a hunger for reason and evidence which finds me swimming upstream more times then I’d like to admit. Did I add that I have an affinity for whitewater rapids? Non-Confrontational happens to be my middle name, so before I dive headlong into what would appear to be a death trap, I check and double check my gear. Life jacket, check. Kayak, check. Helmet and oar, check. Life insurance policy, double check. Launch! The cornerstone of the sacred puppy contract for many breeders is the 6-month spay/neuter contract that is, on the surface, designed to protect dogs from indiscriminate breeding that arguably undermines the health of that breed and potentially contributes to unwanted puppies without homes or families. Sounds reasonable. Sounds responsible, yet the evidence of its benefit is not what you might expect. A video by Dr. Karen Becker http://www.youtube.com/watch?v=enPCZA1WFKY on the health implications of spay/neuter (gonadectomy) inspired me to dig deeper and to ultimately change course. Life jacket, check… I felt fortunate to come upon an article by Patty Khuly, VMD, MBA entitled, ‘Why Tubal Ligations and Vasectomies for Pets Can Be Like Pulling Teeth (And What YOU Can Do About It) http://www.petmd.com/blogs/fullyvetted/2010/april/ligations_vasectomies-7245. Inspired by studies to support my change of plan and armed with a passion for helping our Goldens live longer healthier lives, I charted a course that I was certain would take me into calmer waters. I began the search for veterinarians who were already looking at and incorporating procedures that kept the hormone-secreting organs intact while rendering the dog incapable of reproducing. After months of searching and feeling as though I was going to be swept away by total hopelessness, I happened upon an article in Dogs Naturally entitled, ‘Age To Spay Or Neuter, Ovary Sparing Spay, Vasectomy, Cancer Links’ written by S.F. Chapman DVM, MRCVS, VetMFHom. http://www.dogsnaturallymagazine.com/age-to-spay-or-neuter-ovary-sparing-spay-vasectomy-cancer-links/ This is where I found the Parsemus Foundation and the hope of achieving my goal. I watched the video featuring Dr. Michelle Kutzler doing an ovary-sparing spay and then went on to find the list of veterinarians open to offering this procedure. http://www.parsemusfoundation.org/ovary-sparing-spay/. Imagine my excitement when I saw Dr. Michelle Kutzler, in Oregon, on the list! I dialed the number fully expecting to speak with a receptionist but instead was greeted with a warm “hello.” Dr. Kutzler introduced herself and with a quiet dedication to her purpose, spent over 15 minutes visiting with me about the benefits of the procedure. She shared the truths about how difficult it can be for hard facts and sound research to make its way into medical journals and the challenges to veterinarians who might choose to enter the white waters of peer disapproval. Life insurance policy, double check. Dr. Kutzler told me of a study done by Benjamin L. Hart, DVM, Ph.D., DACVB entitled ‘Effect of gonadectomy on subsequent development of age-related cognitive impairment in dogs,’ published in the JAVMA http://avmajournals.avma.org. Now with some UC Davis studies in hand, I feel confident in presenting our official stand on the 6-month spay/neuter approach. The UC Davis studies can be found in these two links: http://www.news.ucdavis.edu/search/news_detail.lasso?id=10977 and http://news.ucdavis.edu/search/news_detail.lasso?id=10498. Please take the time to review this crucial information and bring it with you to your next vet appointment. 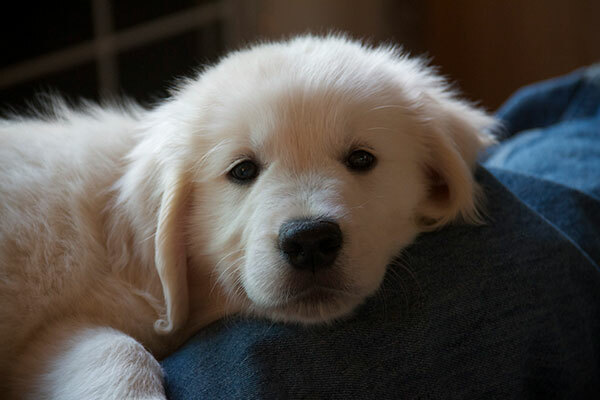 Council House Goldens no longer asks that a puppy adopted from us be spay or neutered at the age of 6 months and believe the better choice to be 18 to 24 months of age. Our preference follows the recommendations of the UC Davis research coupled with an attempt to find a health care provider for your companion who already knows how to perform the gonad sparing procedure or is willing to learn. It is important to us to be willing to change policy when we understand that the change is warranted but we also do all that we can to help our families find professionals that are familiar with the current research and are willing to provide care within the context of open dialogue with the dog owner. Owners should reasonably expect to be included in the conversation with the veterinarian about the choice of care plan for the patient. I have had the experience of taking one of our dogs in to see a vet who was not interested in explaining the care plan for my dog. That experience made it clear to me that I needed to find someone whose practice style better suited my need to be included in every action or procedure done on our dogs. I have been successful in my search and trust that you can be too. Back to my conversation with Dr. Kutzler. Imagine my surprise and delight when Dr. Kutzler said she would teach our veterinarian, and any veterinarian interested in learning, how to perform the procedure that she is seen doing on the Parsemus Foundation website. Her dedication to the health and wellbeing of our companions was evident in both her willingness to teach others and to talk to a dog owner who is also a breeder. Gee, it even seemed as though she enjoyed the time spent with me on the phone. My next task is to change the wording of our puppy application to reflect our new found wisdom. It feels good to be able to share so much good research with our families and our dear, respected veterinarian. It feels empowering to know that there is one more change that we can make that will contribute to a better life for our dogs. And, I know this is your passion too. I know that because every one of you has shared with us the loss of a cherished companion that may have had less pain in the end or been with you, healthy and happy, just one day longer. The rapids have given way to the calm waters of a peaceful river, and I am no longer feeling the rush of adrenaline coursing through my body. I can enjoy the scenery now and am happy to take it all in. Kind of like the tranquility of our life with our Goldens. Thank you, Dr. Michelle Kutzler, UC Davis and all who are working so diligently to improve the health and lives of our companions.